6 tracks: Aisling air Te a Chaidh a Bhathadh (A Dream of a Drowned Woman) * Taibhs ag innse mu Ulaidh (A Ghost Tells of Hidden Treasure) * An Crodh Mara (The Sea Cattle) * Na Sidhichean a’ Gold Leanabh (A Child Stolen by The Fairies) * An Tailleir agus na Mnathan Isgaich (The Tailor and The Fishing Wives) * Gille an Fheadain Duibh (The Lad With The Black Chanter). This is a CD re-release of the 1995 Greentrax music cassette (catalogue number CTRAX9014) and is Volume 14 in the Scottish Tradition Series, from the archives of The School of Scottish Studies. The Series has been widely acclaimed. Peter Morrison, a crofter-fisherman from the small Hebridean island of Grimsay, which lies between North Uist and Benbecula, was recorded by D A MacDonald between 1962 and 1974 on Grimsay. 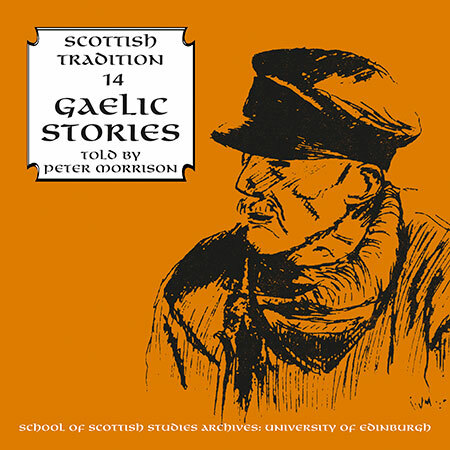 Peter Morrison, a man of many talents apparently, was a very highly regarded Gaelic storyteller and six of his favourite stories are included on this CD. The extensive sleeve notes, previously available as an additional booklet, are now included within the CD booklet and were updated by Will Lamb. The translations to English are included in the CD booklet.